Birmingham made history by hosting the biggest Punjabi awards ceremony, which took place in the UK for the first time. BritAsia TV, the UK’s leading, homegrown Asian entertainment channel, hosted the inaugural Punjabi Film Awards, presented by Metatron Global Fund at the International Convention Centre (ICC), welcoming a dazzling guest list of the leading names in Punjabi film and entertainment. The ceremony was hosted by Punjabi superstar, Jasmine Sandlas, who also performed during the evening alongside Hardy Sandhu, Sharry Mann, UK born Gurj Sidhu and Sunanda Sharma. 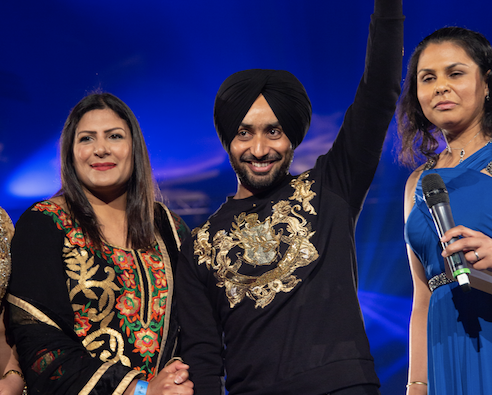 The audience was further blown away by a special, surprise guest performance by celebrated Punjabi singer and international superstar, Satinder Sartaaj as well as the appearance of actor and singer Gippy Garewal. The night was a huge success, with all the nominees and winners being deservingly celebrated and acknowledged for their work and contribution in putting Punjabi cinema on the map, honoured in the UK on one platform for the very first time. UK fans of Punjabi cinema were treated to a spectacular evening of glamour and entertainment while honouring the industry, which has grown in prominence on the world stage in recent years.